Oh how I love to trick my students! Yes, you read that correctly. I take SUCH sublime delight in performing the role of playful psychopomp for them. In my Existential-Humanistic Psychotherapy course, I initiate them into the elusive art of crafting authentic healing relationships in therapy, inviting, and then daring them to eschew their attachments to “empirically supported” techniques and treatments. I cajole them like the Coyote of Native American stories to descend with me into a more shadowy realm, where anxiety and suffering is embraced as transformative, where the DSM-5 and diagnoses are deconstructed and debunked, and where radical phenomenological acceptance of the human complexity of the personhood of the client is practiced and deeply valued. I compassionately hold as sacred their perplexity as they grapple with the realization that in my class they must unlearn (if only for a time, for some) their reflexive need to pathologize clients according to an illusory and arbitrarily defined standard of normalcy. They endeavor to reconcile all their painstakingly acquired manualized knowledge of how to be therapeutic authorities with the dawning, humbling realization that healing most truly happens when they put down the manual and nurture an “I-Thou” connection. They look to me to extinguish their confusion, and instead, I fan it into a greater flame, telling them quite confidently to lean into it. In this way, I am a trickster, loosening the cobbles on the road of their training, making them doubt the surety of their path. I see this role of trickster as one of critical importance. Knowing the territory well, my voice is rich with conviction, and my passion and enthusiasm are infectious. I provide a perspective that is a necessary counterbalance to an approach that otherwise allows them to hide their humanity behind a professional role. Slowly, tentatively, they stop being ashamed of their confusion and embarrassment about the uncertainty of their steps, opening fully to the creative potential for new learning and personal and professional growth. Truth be told, my students inspire me greatly in this—especially when it is MY turn to be confused and uncertain as my personal paradigms shift. Happily, I have learned to take childlike delight in my own embarrassment as well…more on that later. How fitting that I mention balance shortly after the Vernal Equinox, the official onset of spring, one of two points in the solar year when day and night are of equal length. So much of psychology values balance and helping clients find equilibrium amidst the titanic forces of struggle and angst in their lives. I try to use the energies of this holiday in service of balance in my own life as well—despite the fact that my own body is a trickster too. I hit a good stride in my workouts, and my rotator cuff in my shoulder gives out, forcing modifications that require a new balance in exercise routines. My rotator cuff improves, and I challenge myself with heavier weights, only to have my left ankle give way due to excessive tightness in the muscles of my left leg. This injury, ironically, is due to the increase in lower body exercises implemented to avoid further injury to the rotator cuff. Moreover, excellence in teaching and therapy often comes at some expense to quality leisure time with my wife and dogs. Consistent attention to health and fitness routines sometimes interferes with timely grading of papers for school. The endless search for the ideal balance among all the valued aspects of my life frequently takes on the nature of a grail quest. Homeostasis appears to be as elusive as it seems desirable. Yet…what would happen if I ever truly achieved and maintained that balance? Sadly, I believe that my own personal growth would come to a standstill at such a juncture. No growth is truly possible when standing still in the eye of a hurricane, taking refuge from the storm. 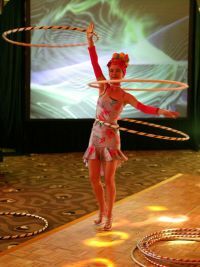 As I type this, I am thinking fondly of an accomplished hula-hoop spinner, reflecting upon how the hoop requires that the body be constantly in motion. The body makes both minimal and wild adjustments to keep the hoop spinning in a deceptively graceful manner. The hula-hoop is truly a study in balanced imbalance. If the person stops gyrating, it falls and is no longer in play. At the Society for Humanistic Psychology conference this month, I had the honor of becoming friends with Ilene Serlin, a dance and movement therapist who captivated me as she demonstrated how to engage in a therapeutic conversation using no words. She responded intuitively to the body movements of a volunteer participant, her body engaging in a dialogue that manifested ultimately in a spontaneous, beautiful dance between them. She inspired me to teach my students about embodiment in new ways. I felt small and quiet as I learned from her, yet also awkward and clumsy, my body recalling many instances of wobbliness in my life as I stumbled upon new ways of becoming emotionally close and intimate with others. I yielded to the longing I felt in her presence for newness in my work, something to fill an emptiness in my own understanding of embodiment and dance. She showed me how much I was missing the receptivity of the feminine in my teaching of gestalt somatic approaches. Ilene also quite generously and unexpectedly gifted me with a DVD of her conversation with Laura Perls, originally released as a VHS videotape in 1988. Upon my return to Chicago, I also promptly shared this DVD with my students. In her conversation with Ilene, Laura Perls speaks of the enormous creative potential of embarrassment, emphasizing that imbalance must be deliberately initiated and risks undertaken for new learning and the prevention of stagnation. Small children, she says, are unafraid and unaware of their own wobbliness, becoming graceful and confident through their willingness to fall down. Perfect balance is neither desirable nor helpful! Moreover, after bombastically proclaiming to my students during the prior week’s class that Fritz Perls acquired the hot seat and chair techniques from Jacob Moreno of psychodrama fame, my students and I all heard Laura clearly say that Fritz was a theater enthusiast in his own right—and that he most assuredly did not steal anything from Moreno, as many claim. We all had a great, good-hearted laugh at my expense and embarrassment, my heart pounding with excitement as the cobbles turned under my trick ankle. I love feeling large and in charge with my students. I have come to love even more when I feel raw, small, and uncertain—when I am letting them see the real me, as a cherished teaching strategy is actively undergoing a significant shift and re-design. My embarrassment is painful and exquisite, and I am a wobbly child. It gives me hope that I might actually master the hula hoop one day. Serlin, I. (1988). Conversation with Laura Perls (DVD). San Francisco: Saybrook Institute.